This year is the 50th anniversary since the founding of New Zealand School of Dance (formerly National School of Ballet). 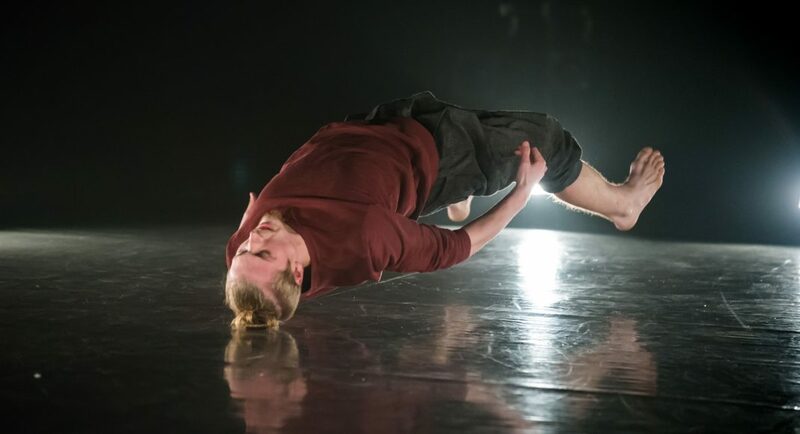 It is an inspired idea to mark that by inviting 10 graduates from across the decades to choreograph solos for current students in the contemporary dance stream. The program, Once, is being performed for a season 8–16 September. To open, all ten performers stand to frame the space, they depart into the shadows, and only the first performer is left. Between items the last dancer links with the next one, in a metaphorical handing on of a baton across the generations. The rectangular stage space has side seating in four sections, which suits some of the dances well, but does pose a real challenge for lighting design. Sixteen floor level lights are used in the majority of pieces, which means that some lights will be shining straight into the audience’s eyes. Whenever strobe light (none of that here) or other light is shone into my eyes, my instinct is to close them—which is of course not a great way to review a dance performance. The program’s three little masterworks adopted different sources of light and the difference that made for me was exponential. The program notes for a dance always interest me. I’m happy if there are none, and happy if there are some that help in some way to illuminate the choreographer’s thinking. Not so happy if there are notes but they don’t help at all as that’s usually a sign that the structure of the dance is less well shaped than might be. It’s an opportunity to communicate parallel to the dance, and should not be wasted, ahakoa iti, he pounamu. 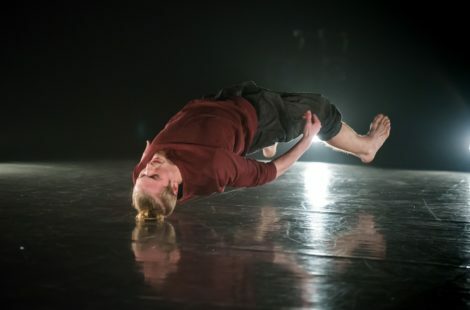 Craig Bary made a strongly physical work for Nick Jachno, who gave a committed performance and it was good to be reminded of Craig’s own stellar dancing across the years. Sacha Copland, known for her quirky sense of humour and brilliant handling of props, had Ella Williams dancing with a bowl on her head to fabulous music by Lajko Felix and Boban Markovic. Eliza Sanders’ piece has a sleepwalking and muttering dancer, Holly Brogan, in a study of troubled introversion. Raewyn Hill switched off the footlights and put strong corridors of light around the edge into which stepped Toa Paranihi to dance a strong and beautiful celebration of himself, the moving body, light on skin, him, Raewyn, and us all. Emma Murray has been working in Europe for some years now and the influence shows. 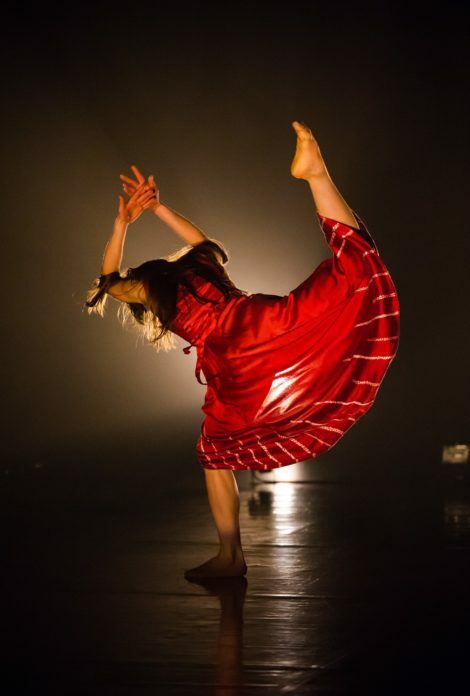 Her piece, for Georgia Van Gils, sits within dance-theatre that follows theme and thought rather than display ‘beautiful’ movement for its own sake. It’s not an attractive or easy theme, to witness a young woman in desperate need of help, thinking of asking for it, but not actually asking in case we are not going to help her. It was a poignant piece, and had the best program notes of the night. 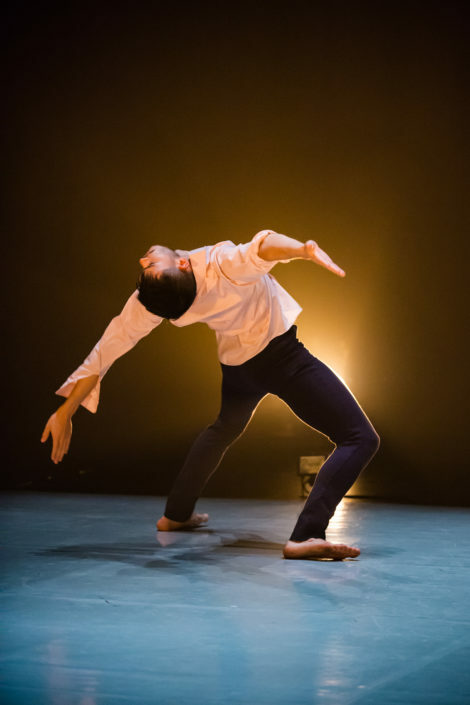 Taiaroa Royal knew well the strengths of his performer, Kent Giebel-Date, and made the dance accordingly—with his hallmark wit of engaging with the audience then inviting us to follow to an intimate place where the male body moving could speak without words. Light on human skin, my favourite thing. Mary Jane O’Reilly made Valhalla, for Jill Goh, strong presence of woman, flying pennants, boots and strop, stripping to prove it, suggesting the burlesque style she has recently focussed on. (This year is also the 40th anniversary of Limbs Dance Company, an enterprise that, thanks primarily MJ and Sue Paterson, brought such joy and fun into so many lives). 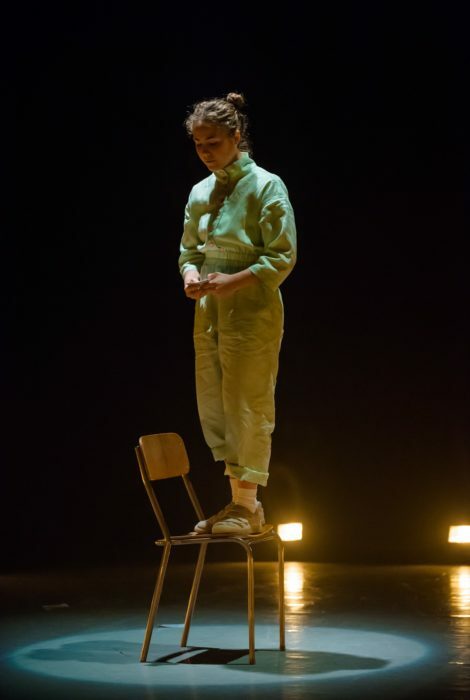 Janessa Dufty made a work for Isabella Coluccio that was at the same time strong and lyrical, and Lauren Langlois in the final slot set a dance for Christina Guieb that presented a woman in meditative involvement in her thoughts. It might have been better to place Daniel Belton’s well-styled work, XYZ, last, since his preoccupation with astral scale and energies lifts our focus up to astronomical places, where we find a perspective and proportion for all our endeavours—in scale as well as detail. So, though this is not a contest, my three strong front runners were Raewyn Hill, Emma Murray and Taiaroa Royal. Well done all. 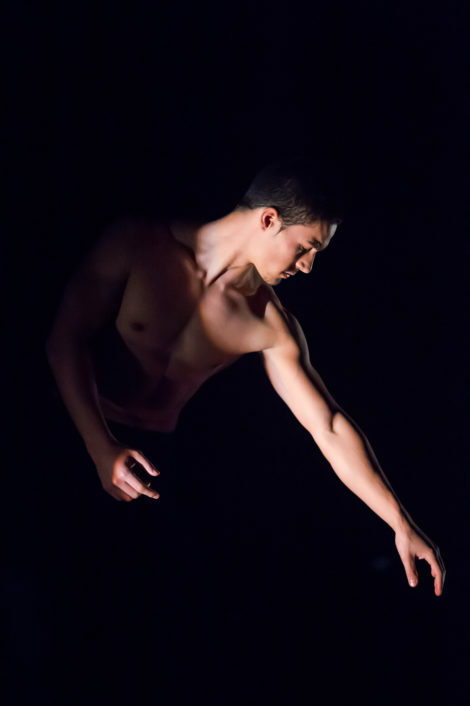 Featured image: Nick Jachno in Falling on succession (choreographer Craig Bary) from the Once solo season. New Zealand School of Dance, 2017. Photo:© Stephen A’Court. So very happy to read of New Zealanders/graduates choreographing en mass in celebration of the NZDS 60 th Anniversary. What joy it would have been for me to be present. So many highly talented New Zealanders around the world so nice to hear they are being asked to choreograph at ” home”. Thank you Patricia. I am lucky to have Jennifer posting about New Zealand dance I think.